During the Feast of Tabernacles at Jerusalem, Jesus goes to the temple and teaches. UMMER HAD PASSED, and the cooler days of autumn had come again. On the green hillsides around Jerusalem many booths, or huts made of the branches of trees, stood in groups, sheltering the people who had come to attend the Feast of Tabernacles, held every year at this city. And during the week of the Feast the temple was crowded with visitors from other parts of the land. On the first day after the feast began groups of people stood together talking about the great Teacher in Galilee, whose miracles had caused much excitement in many places. They wondered whether he would come to Jerusalem and teach them there. Some of them wished he would come, for they enjoyed hearing him teach; others wished he would come because they hated him and wanted to find occasion to put him to death. By and by Jesus came, and straight into the temple he went, to sit down there and teach the people. His enemies believed this would be a good opportunity to catch him, so they sent men to listen to his words and find some fault, that they might accuse him to the rulers. But day after day passed by and still Jesus sat in the temple, teaching all who came to him. No one attempted to drive him away, and no one took hold of him to capture him. Many of the Jews who lived in Jerusalem knew how much their leaders hated him, and they wondered why these men did not take him now and shut him up in prison. They said, "Is this not he whom they seek to kill? But now he speaks boldly and they say nothing to him. Have they come to believe that he is the very Christ?" But the rulers of the Jews, who were the chief priests in the temple, and the scribes, and the Pharisees, and the Sadducees, did not acknowledge that Jesus is the Christ. 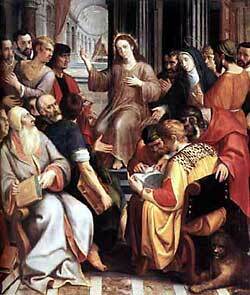 They were very jealous of him because he drew the attention of all the people who came to the Feast. They disliked his teaching because he accused them of only pretending to be righteous. And they sent officers to take him. Even the officers were pleased to hear the teaching of this wonderful man from Galilee. They listened carefully to his words, and they believed that he was not worthy to be punished. So they returned to the rulers without him. The chief priests and Pharisees were angry when the officers returned alone. They asked, "Why have you not brought him?" But the officers replied, "Never did a man speak like this man." And they would not harm him. The men who sent the officers were excited. They asked, "Are you allowing this man to deceive you as he is deceiving the other people? And have any of our own number of the rulers believed on him?" Nicodemus, the Pharisee who had come to visit Jesus one night, sat among the angry rulers. He loved Jesus and believed in him. But he was afraid to let the other Pharisees know, for fear they would hate him, too. Now he asked timidly, "Does our law judge any man before it hears him and knows what he is doing?" His angry friends turned on him and replied, scornfully, "Are you from Galilee? Do you not know that no prophet comes from that country?" And so saying they dismissed their meeting and went to their homes.